From I-71 (coming from the north or south), exit US 30 east toward Wooster. About 1 mile, turn right (south) on Ohio 603. About 1 mile, turn right on Ohio 430. About 2 miles, turn left on Harlan Rd (a former motel is on the corner of 430 and Harlan). Follow Harlan to Milligan. Turn left. 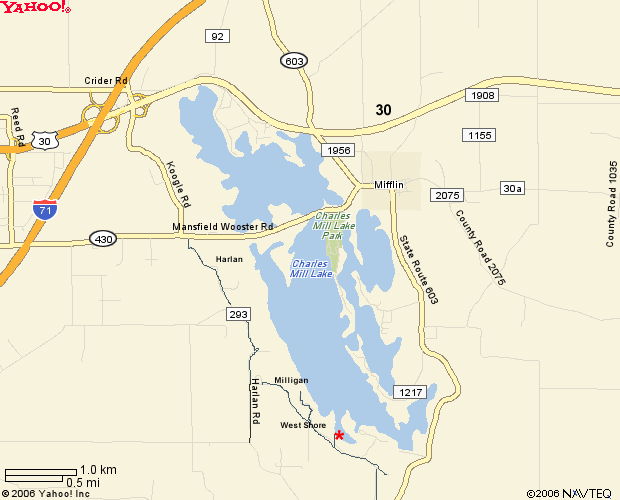 Follow Milligan about 1 mile, past the west shore cottage area and the Ashland County sign. Milligan becomes TR 1265. The MSC driveway is on your left. If you get back to Ohio 603, you have gone too far! From Wooster, follow US 30 west toward Mansfield. About 2 miles before I-71, turn left (south) on Ohio 603. About 1 mile, turn right on Ohio 430. About 2 miles, turn left on Harlan Rd (a former motel is on the corner of 430 and Harlan). Follow Harlan to Milligan. Turn left. Follow Milligan about 1 mile, past the west shore cottage area and the Ashland County sign. Milligan becomes TR 1265. The MSC driveway is on your left. If you get back to Ohio 603, you have gone too far!